Private Bungalow for sale in Cyprus. Bungalows in Cyprus are really popular with foreign buyers and local Cypriots. Always in demand, yet there are not many come up for sale. The resale property market offers more villas and apartments. This bungalow has 2 double bedrooms, outdoor living area and a very private pool and sunbathing area. Here's is a picture of the bungalow as you approach it from the quiet residential road. We know the property very well, as we have been looking after it for a friend. It's a very comfortable property. Ideal for permanent living, holiday home or for renting out. Since the recession hit Cyprus, loads of people are choosing to rent. So there is a great opportunity to earn income from renting the bungalow on long term contracts. Since this bungalow has been put on the resale market, we have had many people ring us to inquire if the owner would consider renting it out long term. So if you bought it, there wouldn't be a problem finding tennants locally. Situated in a peaceful spot, away from the main roads in Xylofagou, yet close enough to the centre of town for local shopping. Many people living locally are shopping locally now to save money on petrol. It only take 5 minutes to walk into town from the bungalow. The biggest shopping town of Paralimni is only 20 minutes by car and the popular resort of Ayia Napa only 10 minutes. The bungalow is built on approximately a 200m plot. There is a double gate entrance at the side with space for car parking. Walking up the side of the bungalow takes you to the back of the property to the secluded private swimming pool, shower, sunbathing and bbq dining area. All the windows and front patio door are double glazed. The owner also installed white shutters which keep the bungalow cooler during the hot summer months. Flyscreens have also fitted to keep the flies out! There is an open plan living room with patio doors to the front. All the lounge furniture and satelite tv are being left by the owner. The kitchen is well fitted out with attractive high quality granite worktops. All the appliances will be staying. The back door from the kitchen leads out to the pool area. The entrance to the bedrooms is through a door off the living room where there is a corridor leading to both double bedrooms and the main bathroom. Bedroom one has its own ensuite shower room. 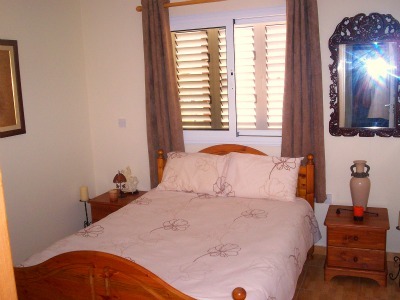 Both bedrooms have fully fitted floor to ceiling wardrobes and air conditioning units. All the furniture in both bedrooms including solid pine beds and side cabinets are being left by the owner. Because this bungalow for sale in Cyprus is a private resale, you can be assured you will get a cheaper deal than properties being sold through any Cyprus estate agent. Agents charge 5% commission on every sale. Which means the price of property is inflated in order for the property owner to recoup at least some of the commission. Therefore, this private sale is priced to sell without any commission added to it. The price you see is not set in stone. The owner of this property is open to offers. He would prefer you contact him to discuss the price. 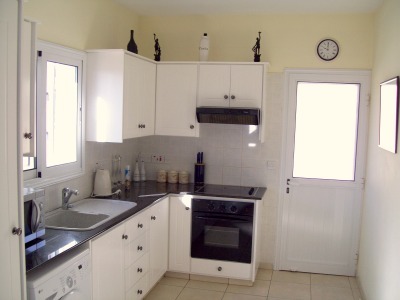 Don’t miss out on this bungalow for sale in Cyprus. To book a viewing, just fill in the inquiry form to get in touch.